Chinese seal carvings are an ancient art that combines calligraphy and engraving. Chinese seal carvings, or Chinese chops, evolved from a practical need to be able to affix a signature to documents and carvings. But these custom stamps became an art form as well as a practical devise, with its intricate Chinese calligraphy and beautiful carvings. Chinese seal carving started in ancient Chinese times, during the Qin dynasty (221-210 B.C). The Chinese seal carving was originally used as an imperial seal – a seal used by the emperor to, in effect, put his stamp of approval on documents. The royal seal was called the Xi (which can literally be translated into “the imperial seal”). These Chinese seal carvings were used only by royalty. After this dynasty, another type of seal developed. This Chinese seal carvings were used for non-official use by private individuals as a personalized stamp. These non-official custom stamps were called Yin. During the Tang Dynasty, (618 – 907 A.D.) the name for the seals changed, in part due to a superstition about the similarity in pronunciation to another Chinese word which meant death, during this period Chinese signature stamps became referred to as Bao. Chinese seal carvings became a symbol of power and authority. The custom stamp was used to denote proof of commercial trading. The carving was used extensively by important business owners and members of the imperial council, the ruling class of people. The Chinese carved seals developed as Chinese characters developed and changed, and as the recording of characters changed. Originally, Chinese characters were inscribed on ivory, bones and tortoise shells. Later, characters were inscribed on metal. Chinese seal carvings were (and are still) carved from ivory, jade and other semiprecious stones. Other materials included gold, silver, rhinoceros horn, magnet, and tiles. As writing methods changed, the materials for recording writing changed as well. Writing became inscribed on bamboo strips. To ensure confidentiality, the bamboo strips were put inside a wooden trough which was sealed with mud. The personalized stamps were used to press into the mud, making it obvious if someone had broken the seal to read the documents. Because the mud was put onto the wooden trough in a very thick layer, the custom stamp had to be carved deeply to make a clear and distinct stamp. 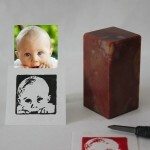 The stamps used to create characters on pages were much finer and sharper engravings than the personalized stamp. The Chinese cultural is a culture that reveres its artists. Talented artists (poets, painters, and even calligraphers) are acknowledged for their skills in a way that is uncommon in many other cultures. It is common in most cultures to see artists sign their work; however, Chinese artists adapted the carved seal to use the seal to mark their art. 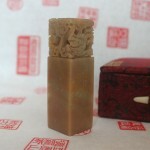 These artists created unique seals that became identified as their Chinese signature stamp. Every time they stamp their work with the seal, they are putting their signature to their work. There is a great deal of pride in finding a seal that is a unique and artistic expression of their work. Today Chinese carved seals are still used. Many business people use specially designed seals as their Chinese name stamp, to indicate their reliability as business people and to confirm their identity. 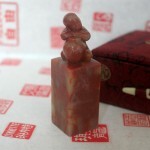 I have as part of a collection of very old Chinese art, a Chinese seal , carved from a rough jade block , approx. 3 1/2 inches square. If I send a picture of carving ; would you be able to provide me with an interpretation of the writing on the face of the seal. Please feel free to email us a picture of the seal. We will see if we can read the old Chinese characters. You can find our contact information by clicking “contact us” link at the bottom of this page. Thanks! Thanks for the comment. We have sent an email to you.